Postmodernism is no longer an external threat, sequestered to the ivory towers of academia. Today it has infiltrated the local church. How often do we hear sentences that begin with the words, “To me God is like . . .”? And how many Bible studies posit the question, “What does this verse mean to you?” In the postmodern mindset, the only One who doesn’t have a say in how God is defined is God Himself. But the subjectivity doesn’t end with who God is. It extends to how He relates to us and vice versa. Christ’s commands are now optional, His message ambiguous, and His salvation a path of our own choosing. Over the last few weeks on the blog, John MacArthur has explored the nature of truth and its prospects of survival in a postmodern world. In his sermon “Is Jesus the Only Way?” he examines postmodernism’s assault on the gospel itself. There is a widespread ambiguity about the gospel, and there are some very popular prominent evangelical leaders who are apostles of this ambiguity, who are content to leave the precision out and have a kind of gospel that is like soft clay and can be shaped into any form that satisfies you. Now we can get some things wrong without severe eternal consequences, but we can’t get this wrong without severe eternal consequences. The heart of our faith, of course, is the gospel of salvation, and we must understand the gospel as the gospel truly is in its saving reality and its saving power. True Christians have always believed and taught that you can’t be saved from eternal hell unless you hear the gospel of Jesus Christ and believe that gospel. There’s no way to overstate the importance of Christ’s exclusive role as the Savior of sinners. Every other option leads to eternal damnation. That’s why the true church needs to be continually reminded of the clear dichotomy between the truth of the Christian gospel and the utter falsehood of every other religious system. We must not be deceived by false gospels that redefine truth, nor by compromised gospels that dilute it. We are armed with the true gospel—the only means by which sinners can be reconciled to God. To that end, “Is Jesus the Only Way?” does a great service to the ultimate cause of every Christian. 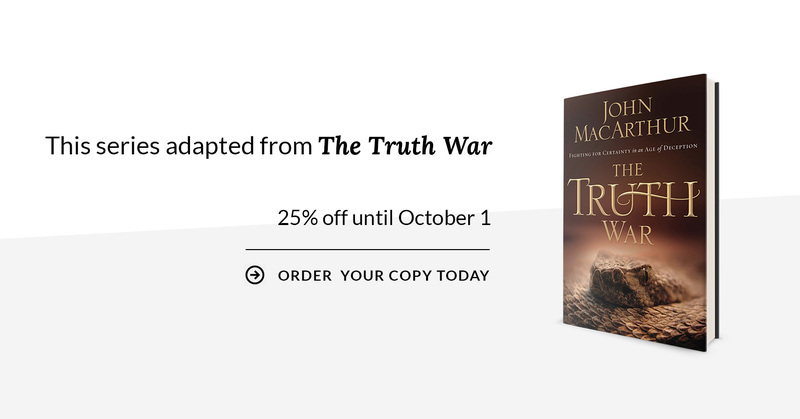 John MacArthur’s sermon is a timely and necessary reminder that when we come to Christ, we have found the very personification of “the truth” (John 14:6). Click here to listen to “Is Jesus the Only Way?”.